You might recall Samsung's last ad for the Samsung Galaxy S III and the Samsung GALAXY Note II. The two devices were taken into the workplace. More specifically, it was for a made-up software company and its made-up game "Unicorn Apocalypse". The software firm had just announced a new BYOD policy and we saw a number of devices being used at the company. Besides the two flagship models from Samsung, there was at least two BlackBerry models and an Apple iPhone. So now we assume that some time has passed and as the new ad opens, the company is in an uproar. Unicorn Apocalypse has been leaked. Heads will roll! 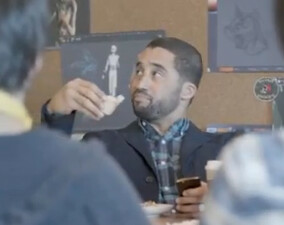 The guy who waved around his BlackBerry in the last ad said it wasn't him. The IT head says that all smartphones need to be as secure as the Samsung Galaxy S III and the Samsung GALAXY Note II. So who is responsible? Which phone had it's pocket picked? Considering that Samsung made the ad, we can be sure which two phones weren't responsible. In the meantime, Samsung wants to remind you about its SAFE (Samsung For Enterprise) initiative. I don't think so. This ad was hitting on the iPhone. with the amount of leaks of b10 ..it was just a matter of tym b4 sum1 took a shot at them..